Developed as a universal platform for various Matthews print technologies, you can now manage messages and settings for multiple printers across one or several production lines or packaging locations. Best of all, MPERIA™ is scalable, allowing your business to grow without impacting your marking system. The MPERIA™ controller platform manages multiple Matthews print technologies, including, high resolution piezo ink jet, high resolution thermal ink jet, and drop on demand valve ink jet – all from a single interface. 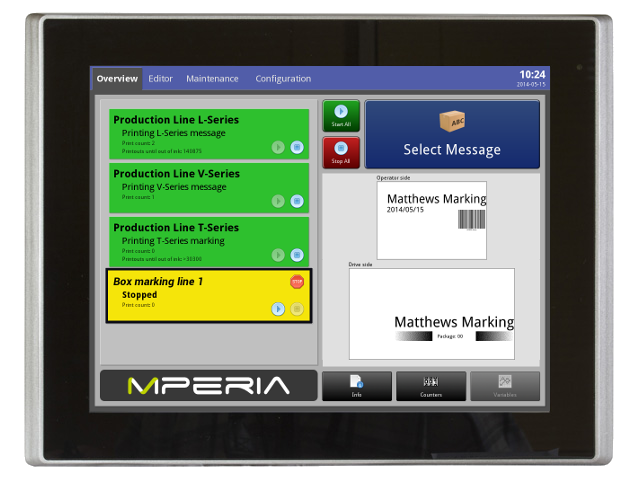 MPERIA™ allows you to manage messages and settings for multiple printers across one or several production lines. Best of all, MPERIA™ is scalable, allowing your business to grow without impacting your current marking system. 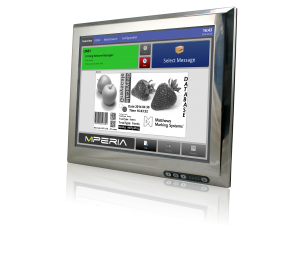 A intuitive, touch screen GUI with PC-based hardware, the MPERIA™ controller is simple to use and is available in several sizes to meet your needs. Create, edit and manage your printer files easily with MPERIA’s built-in message editor. On-screen editing allows you to build and edit the exact message that will print on the production line. The MPERIA™ Standard has the capability to support all VIAjet™ printing technologies for simultaneous print control and is ideal for primary, secondary, and tertiary marking and coding. Upgrades allow for a virtually unlimited number of VIAjet™ devices and functionality. The 12” MPERIA™ Standard controller also comes in an enclosed version. The MPERIA™ Standard H.E. has the same capability as the MPERIA™ Standard, and offers a 15” touchscreen in an IP65 stainless steel enclosure making it suitable for harsh environments.